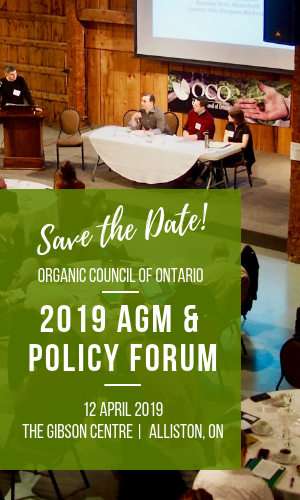 The Bill (Organic Products Act, 2018) was developed in partnership with the Organic Council of Ontario (OCO), the association for organic businesses in Ontario. It was initially introduced by Peter Tabuns, MPP for Toronto-Danforth (NDP), and co-sponsored by Sylvia Jones, MPP for Dufferin-Caledon (PC) on September 13, 2017. The bill passed 2nd reading and was sent to committee, but before it could be debated further, legislature was prorogued by the Premier in March of 2018. A new version of the bill (Bill 54) has been introduced as of Nov. 12, 2018, by PC MPP Jim McDonnell. The full version of the updated Bill will be posted here when available. Product definitions in the proposed bill allow for organic products to include items outside of those currently within the scope of the Canadian Organic Standards. This means there is potentially room within the bill to cover textiles and body care products within the province of Ontario. While the proposed bill would require the provincial government (through the Minister of Agriculture, Food and Rural Affairs or the Minister of Government and Consumer Services) to regulate the term “organic”, it does not specify exactly how this would happen. While the Minister would decide on how to regulate organic certification in Ontario, it is likely that Canadian federal standards would be adopted and federally accredited certification bodies selected – as is the case in other provinces with similar legislation. However, the language in the Act allows us to create a made-in-Ontario solution that could potentially allow for additional certification programs that appeal to small-scale and/or direct market producers. Legislation would also see the Minister (or a body appointed by the Minister) create an Organic Products Register. It would list all operators’ products that have been certified organic and be published on a Government of Ontario web site. On advice from other provinces, we worked to allow for flexibility in assessing and enforcing penalties for non-compliance. This includes wording on fines and convictions for violating the act, as well as administrative monetary penalties, which can be imposed without involving the courts. Including both within the Act provides the Ministry with tools for addressing different types and scales of offences. The proposed legislation would work on an easier-to-enforce, complaints-based system, rather than a proactive one. As such, resources required for enforcement would be minimal. Clearer intra-provincial regulations, however, may also increase the CFIA’s efficacy in monitoring and enforcing “organic” claims. For producers: Producers who already have certification will see their investment supported through law. Smaller producers who may see challenges with transition and certification costs will be engaged by the Organic Council of Ontario in developing a small-scale solution and advocacy for greater supports. For retail: This legislation helps reinforce the responsibility retailers have to maintain the integrity of their products and labelling systems. There may be penalties for mislabelling products as “organic” in retail locations. For consumers: Consumers will have greater assurance that the “organic” products they buy are indeed organic. They will also have access to a register of all producers with organic certification to make more informed purchasing choices.